I know Easter is just around the corner because every time our girls see their Grandma, they are reaching into her jacket pockets in search of chocolate eggs. Easter tries very hard to compete with Halloween for “Sugar Holiday of the Year”. This means, that the youngest ones in your piano studio may come to lessons with a little more hop in their step… And when this happens, any piano teacher’s survival guide will tell you to switch up lesson activities often and get those kiddos off the bench. To help you get your primer-level students off the bench while still teaching valuable musical skills, today we’re sharing Hop and Seek: a printable piano game you can use to help reinforce keyboard awareness. 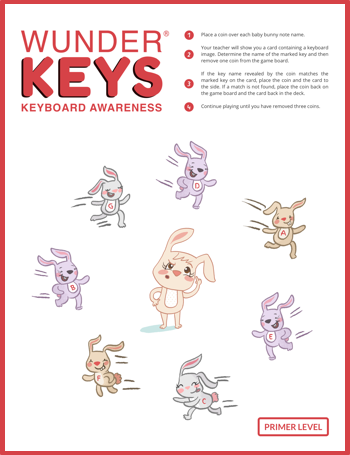 To have a blast reinforcing keyboard awareness, click on the image below to download today’s printable. And while you’re here, don’t forget to check out our WunderKeys Method Books on Amazon.